I just wanted to say thank you again for the mattresses and the sanitary towels that you so kindly donated to our children. 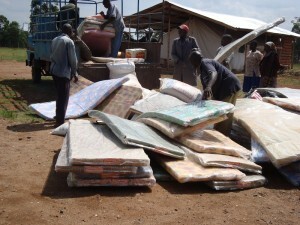 Attached a picture of the mattresses being off-loaded from a truck and being taken to the dormitories. Our children are very happy now that each one of them is sleeping on a mattress and not on wood.